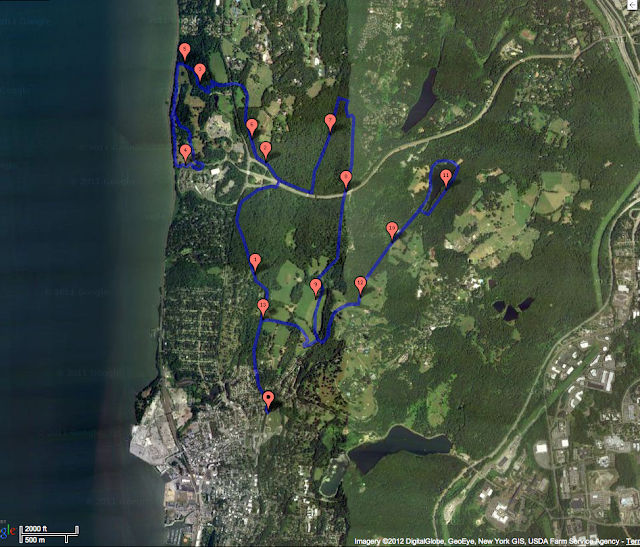 The Inwood Hill Runners have been looking to shake things up a bit on our long runs, so a few weeks ago we took the train to Dobbs Ferry and ran down the OCA back to Inwood. This week we carpooled up to Sleepy Hollow High School and tackled 14 miles of hills, views and nature. It was the perfect day for such an adventure with sunny skies, warm sunshine and a nice breeze. In addition to the great weather, we had a nice little map and route from Joe to follow. The route was easy to follow and we enjoyed the hills and flats and bridges along the way. Our group of 8 stuck together for the most part, stopping just a few times to keep everyone together and once to ask a man with a dripping wet dog if we were headed in the right direction. He told us we weren't and sent us back towards the visitor center, but after talking with Joe about it I realize we we're going the right way. After our gorgeous run, we ate lunch at The Horseman in Sleepy Hollow and filled up on ice cream in Tarrytown before heading back to the city. It was a full day with some really fun running friends. We even picked up two stragglers, haha, friends who had run the OCA down from Croton-Harmon earlier in the morning. If you haven't been up to Rockefeller State Park, I highly recommend it. There are always groups up there running on the weekends, including a group from the Bronxville Running Company store on the last Sunday of the month. 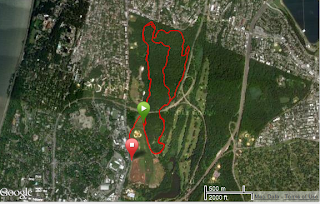 Here's the map of the approximate course we ran, it was beautiful! The elevation was pretty nice too, a gain of 967 ft according to my Garmin. I write this with sore legs and a still tired body on Monday morning, but with a bag containing the rest of a delicious carrot cake resting on the floor between my feet. This will make sense soon, if you aren't sure how carrot cake and sore legs could possibly be related. 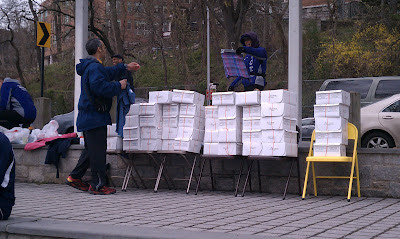 Yesterday morning, April Fools jokes aside, was the annual Urban Environmental Challenge 10K held in Van Cortlandt Park and organized by the friendly folks of the Van Cortlandt Track Club. They always put on a great race- low key, well organized, fun and challenging. You may remember them from the VCP Summer series 5k's where I try desperately to bring home a carrot cake muffin every other Thursday evening. This was my first time running the UEC 10K and my advice is to listen to people when they tell you it is a tough race. I ran into several familiar faces from the summer 5k's and the Uptown running community which is always really fun. I was warned ahead of time that much of the course is single track and so I tried to put myself in a good position early on and I was glad I did. As we turned into the woods and onto the cow path, everything felt familiar until we took a sharp left onto cemetery hill, the most evil of VCP hills, but near the top we turned into deeper woods along a leafy, rooted, rocky trail marked by little orange flags. The course was easy to follow and there were tons of marshalls out directing the runners, so I doubt anyone got lost. The course weaved through northern parts of the park I'd never seen before and the changing terrain made the miles seem to go by faster than usual. The course was two loops, but not identical loops so we had to stay on our toes a bit. I was definitely working really hard the whole way, but I could hear the folks around me wheezing and huffing just as much. It was almost nice getting stuck behind someone else on narrow track because it gave me a chance to slow down a beat and catch my breath. It felt like the whole course was either uphill or steep, rocky downhills, but there were also a few sandy stretches. The trails weren't very muddy, despite the wet weather on Saturday and the stream crossing was lacking the stream! We've had an incredibly dry 3 months, so whatever moisture there was on Saturday soaked right into the ground. 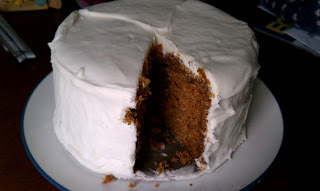 So, back to the carrot cake. 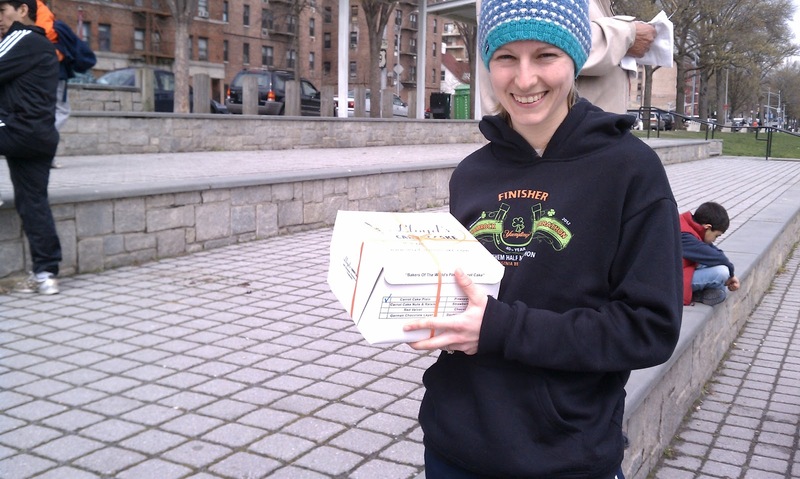 VCTC races are known for their fantastic prizes for overall and age group winners-carrot cake or muffins from Lloyd's bakery which is directly across the street from the park. I am always motivated by the possibility of a muffin when I run these races, knowing that if the field is small enough, I might catch a slot in my age group top 3. When I crossed the finish line, red-faced and out of breath, I spotted a stack of boxes from Lloyd's and wondered why they were so big. These didn't look like muffins.... Hmm. I peeked at the results sheet as I caught my breath and I caught a glimpse of my name in the 3rd place slot. Wahoo! It turns out that Lloyd's delivered carrot CAKES instead of muffins this time! Like good sports we waited around for the awards before and after mine and cheered for the folks who nabbed cakes for their hard work. I was beat by a man from FRNY who won his age group too, 60-69!! Damn, he was breathing down my neck for a half mile or so before passing me with less than a mile to go and I simply couldn't catch him for fear of injuring my already sore hamstring. Oh well, I'll get him next time! There was an awesome Dad & son team out there too, they finished in a spectacular 65:00- the kid is 11! As usual it was a really supportive, fun crowd and everyone had fun, I really enjoy the relaxed feel of VCTC races. My results- Now I haven't done this race before so I have no comparison time, but my time was 54:43. Garmin says that's an avg pace of 9:11 with the slowest mile (2) a 10:10 and the fastest mile (6) at 8:11 pace. I was 58 overall out of 202 and 3rd for my AG and 10th female overall. 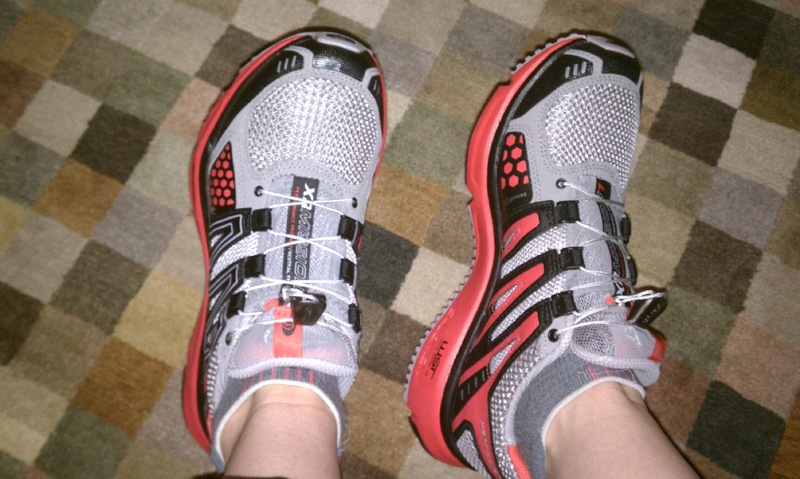 My feet and legs were so sore yesterday from running old, clunky trail shoes that I went right down to EMS and used my birthday gift card on a new pair of Solomon Missions. They're super light and comfy, I can't wait to try them out...once my ankle stops aching.